Das, P. and Sahoo, S. (2017). In vitro Floral Induction of Cuscuta reflexa. Bio-protocol 7(2): e2104. DOI: 10.21769/BioProtoc.2104. Floral initiation and development in the angiosperms is the essential step on which the yield of the plant depends. Sometimes external climate or any abiotic stress hinders the floral initiation and ultimately affect the plant yield. Hence, in vitro floral induction and development can help to overcome the external climatic factor. Furthermore, the protocol for in vitro floral induction in the parasitic angiosperm like Cuscuta reflexa has not been reported yet. We have standardized the protocol for floral induction in the parasitic plant Cuscuta reflexa. In this study it is established that MMS (modified Murashige Skoog) media supplemented with 2 mg L-1 NAA (naphthalene acetic acid, plant growth regulator) and 2 mg L-1 2,4-D (2,4-dichlorophenoxy acetic acid, plant growth regulator) supported floral induction after shooting in vitro. Furthermore, we found that MMS media supplemented with 2 mg L-1 2,4-D rapidly induced floral buds directly from the nodal explants without any shoot elongation. This protocol will help the researcher to induce flower in vitro in the other angiosperm plants along with Cuscuta reflexa. Cuscuta reflexa is a parasitic angiosperm parasitizing on a huge number of angiosperms (Kuijt, 1969). The ability to cause severe damage and loss of yield in the host plant has made this species important for scientific study (Nun and Mayer, 1999). Most of the Cuscuta species are non chloroplastic except few which have functional chloroplasts (Hibberd et al., 1998). Development of seedlings from larger embryos of C. reflexa in white’s medium has been reported (Maheshweri and Baldev, 1961). Floral induction of C. reflexa in short day period as well as dark conditions has been seen in vitro (Baldev, 1962). In vitro floral induction of Cuscuta japonica in short day conditions has also been established by Furuhashi et al. (1991). Specifically, floral induction and effect of growth regulators on floral induction of C. reflexa has not yet been studied. A complete tissue culture system for Cuscuta trifolli in liquid MS culture has been reported so far (Bakos et al., 1995). The floral induction in C. reflexa on modified white’s medium, subjecting the plant to different light and dark conditions, has been studied years back (Baldev, 1962). Here we have shown a complete in vitro culture system for floral induction in C. reflexa. Concentration of 2,4-D played a significant role in floral induction. Supplementation of NAA along with 2,4-D induces shoot followed by flower, but supplementation of only 2,4-D induces flower directly from nodal explants without showing any stem elongation. This result is very attractive and is showing the importance of 2,4-D in floral induction of this plant. Nodal region (Figure 1A) of the Cuscuta reflexa plant (2-month-old) grown naturally on bougainvillea plant was taken as the starting material. Keep small pieces (around 20 pieces taken here) of Cuscuta reflexa nodal stem explants (1-2 cm length, Figure 1A) inside a beaker. Treat (submerge) the explants in 100 ml of 1% Bavistin solution for 10 min inside a laminar hood to make those free from dust or any other external contaminations. Figure 1. Floral induction from Cuscuta reflexa nodal explants. A. Nodal explants inoculated in MMS media supplemented with floral induction hormone/hormones. B and C. Shoot regeneration following floral induction in Cuscuta reflexa nodal explants where the MMS media was supplemented with both 2,4-D and NAA. 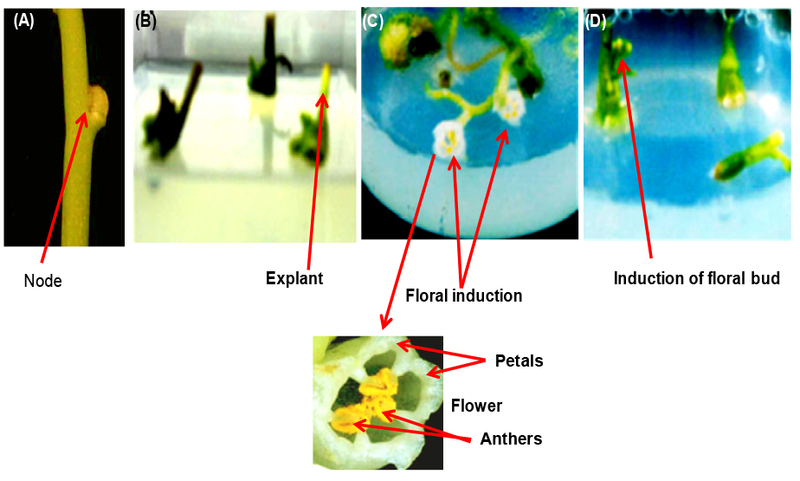 D. Direct floral bud initiation from Cuscuta reflexa nodal explants where the MMS media was supplemented with only 2,4-D.
Rinse the explants with autoclaved distilled water inside a laminar hood by brief shaking with hand. Decant the distilled water and pour 100 ml of 0.1% HgCl2 into the same beaker for surface sterilization inside the laminar hood. Surface sterile the explants for 5 min with brief shaking by hand. Inoculate some of the explants (stuck up to 0.5 cm of 3 to 4 explants into media of one flask, Figure 1A) in the conical flask containing floral induction media-1 and inoculate some explants in floral induction media-2 (method for preparation of floral induction media-1 and -2 is described in Recipes section). Plug all the conical flasks containing the media with the explants air tight to avoid any bacterial and/or fungal contamination. Keep the conical flasks inside a tissue culture room where controlled light (1,000 lux) and temperature condition (28 ± 1 °C, 12 h dark/light period) will be maintained. Notice the proliferation of nodal region (Figure 1B) and generation of shoots and/or floral buds. It will take around 25 to 30 days to initiate floral buds. Floral induction media-1 (200 µl 2,4-D/L and 200 µl NAA/L supplemented in MS media) results in shoot regeneration following flowering initiation (Figure 1C). But floral induction media-2 (200 µl 2,4-D/L supplemented in MS media) resulted in floral bud initiation without shoot elongation (Figure 1D). The experiment has been repeated thrice independently. All the analysis has been done manually or visually. Nodal region of the plant should be taken as explants as from the nodal region new callus or branch will develop quickly in comparison with the other parts. Hands should be washed and sterilized (with 70% ethanol) properly during the whole experimental process. Hormones should be filter sterilized before use. Floral induction media should be prepared in the conical flasks or jam bottles instead of Petri plates to get some space for the development of vine shoots. Surface sterilization of the explants should not exceed more than 10 min as it may cause tissue damage. Light, temperature and humidity should be maintained properly in the culture room. If bacterial or fungal contamination is observed on the media surface, the explants should be transferred to new flasks/jam bottles containing fresh media. 2,4-D and NAA can also be added before autoclaving of media. But if filter sterilized, it can be added after autoclaving of media. The media need not to be pre-cooled for adding hormones. Note: All the solutions can be freshly prepared or stored solutions (at 4 °C, stable for 30 days). Authors are thankful to Department of Botany, Utkal University, Govt. of Odisha for the financial support. Authors acknowledge previous work published by Das et al. (2011), from which this protocol is adapted. Bakos, Á., Fári, M., Toldi, O. and Lados, M. (1995). Plant regeneration from seedling-derived callus of dodder (Cuscuta trifolii Bab. et Giggs). Plant Sci 109(1): 95-101. Baldev, B. (1962). In vitro studies of floral induction on stem apices of Cuscuta reflexa Roxb. - a short-day plant. Ann Bot 26(2): 173-174. Das, P., Kar, M. and Sahoo, S. (2011). In vitro hormone-regulated growth and floral induction of Cuscuta reflexa: a parasitic angiosperm. Acta Physiol Plant 33(3): 1031-1035. Furuhashi, K. (1991). Establishment of a successive culture of an obligatory parasitic flowering plant, Cuscuta japonica, in vitro. Plant Sci 79(2): 241-246. Gamborg, O. L., Miller, R. A. and Ojima, K. (1968). Nutrient requirements of suspension cultures of soybean root cells. Exp Cell Res 50(1): 151-158. Hibberd, J. M., Bungard, R. A., Press, M. C., Jeschke, W. D., Scholes, J. D. and Quick, W. P. (1998). 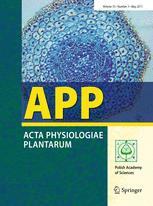 Localization of photosynthetic metabolism in the parasitic angiosperm Cuscuta reflexa. Planta 205(4): 506-513. Kuijt, J. (1969). Cuscuta, Cassytha, Lenoaceae, and kramereaceae. In: Kuijt, J. (Ed). The Biology of parasitic flowering plants. University of California Press, pp 136-143. Maheshwari, P. and Baldev, B. (1961). Artificial production of buds fom the embryos of Cuscuta reflexa. Nature 191: 197-198. Murashige, T. and Skoog F. (1962). A revised medium for rapid growth and bioassays with tobacco tissue cultures. Physiol Plant 15(3): 473-497. Nun, N. B. and Mayer, A. M. (1999). Culture of pectin methylesterase and polyphenoloxidasein Cuscuta campestris. Phytochemistry 50(5): 719-727. How to cite: Das, P. and Sahoo, S. (2017). In vitro Floral Induction of Cuscuta reflexa. Bio-protocol 7(2): e2104. DOI: 10.21769/BioProtoc.2104.